So much is made today of the religious beliefs in the lives of public figures, especially politicians and political candidates. It seems that one almost has to declare strong Christian alliances in order to satisfy certain audiences, whether one seems to practice those principles or not. People these days often wonder about the religious beliefs of our founders, and frequently align them with their own. The problem with this thinking is that it would appear that public figures in the eighteenth century tended to view religion as a private matter. It just didn’t come up in public debate. 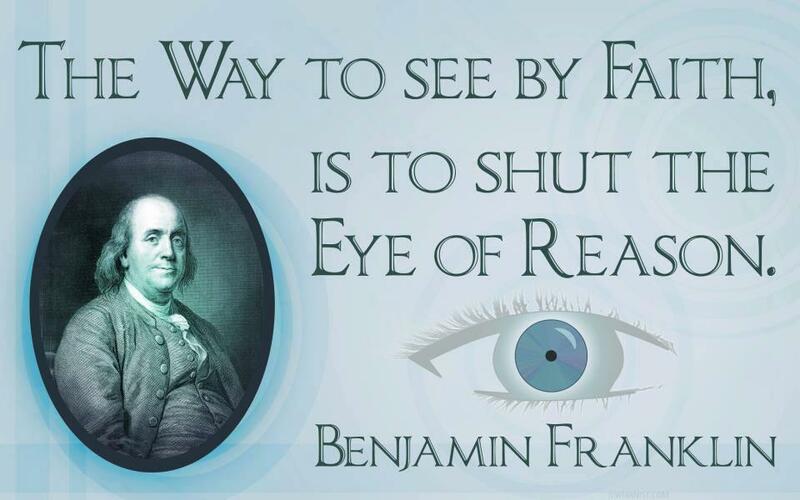 I have been asked, as Benjamin Franklin, about my religious situation many times. Let us look at Franklin and religion. 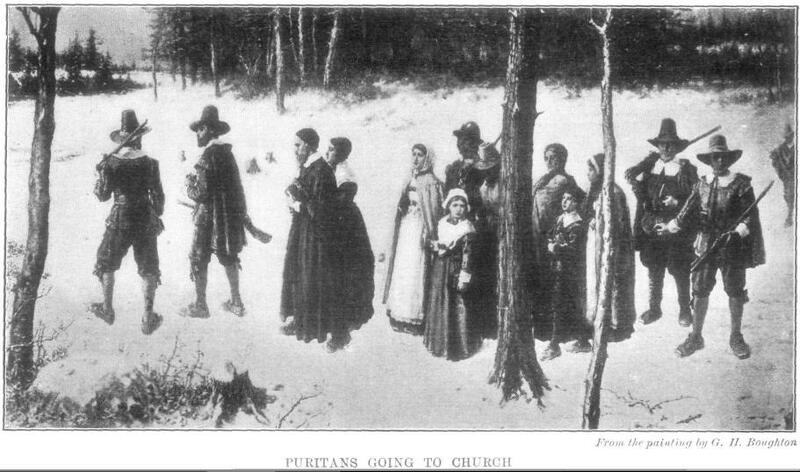 Benjamin Franklin was born in Puritan Boston at the dawn of the eighteenth century, to a devout family. Josiah Franklin was active in the Old South Church, and certainly taught his children about his faith. He even intended for Benjamin to go to Harvard and become a clergyman, noting the obvious intelligence of the boy. Josiah soon realized that the bright young Ben was also questioning and sometimes contentious when it came to questions of religion. Ben rejected the Calvinist doctrine that was central to Puritan belief, and Josiah abandoned any hope of grooming Ben for the clergy. In fact, he took him out of school after two years and apprenticed him to a trade. It would be a mistake to assume that Franklin therefore had no interest in religious things. An interesting relationship in Ben’s life was his friendship with George Whitefield, the English evangelist. Whitefield came to America during the Great Awakening, a religious revival that was sweeping America and Europe. 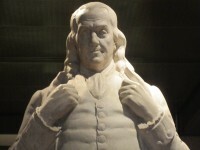 Franklin was impressed with the power of Whitefield’s preaching, and the way that he could address hundreds on the street, and still be heard more than a block away. This street preaching was increasingly necessary because local clergy were jealous of Whitefield’s success, and refused him access to their pulpits. Franklin seemed to find this repugnant in William Penn’s city of religious freedom, so he set about to have a building erected for visiting ministers to use for their services. He declared that it would be available for visiting clergy regardless of their religion, “…even if they be Mohametens (Muslims).” The building later became the first home of the University of Pennsylvania. So, Franklin believed strongly in that religious freedom Penn had established in Pennsylvania. He did, in fact, support nearly every religious institution in the city financially, both in his lifetime and after. A benevolent God created the world, and governed it. He was to be worshipped and served. The best way to serve him was to serve one’s fellow man. Sometime, either now or in the future, virtue will be rewarded and vice punished. Sect and ritual are like a pastry, wrapped in red or yellow paper, tied with wool or flax thread, none of which affect the contents. The differences are but paper or string. One other anecdote from Franklin’s time in Paris is a story that he told about an old Frenchman on his deathbed. This story shows Franklin’s mischievous way of teasing, but it also shows his Enlightenment view of matters held sacred by others. 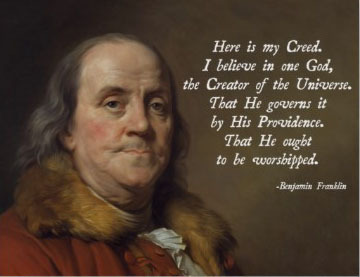 So, how do we answer the question of Benjamin Franklin’s religious views? We can only judge him, or anyone else at the time, by what they said and did. Did Franklin practice what he preached, by serving God by serving his fellow man? I believe that he did.